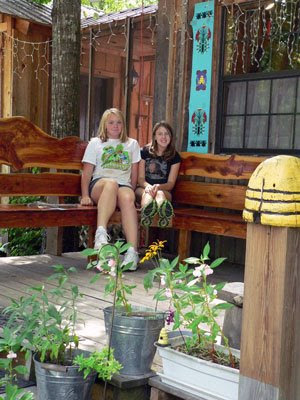 Appalachia & Beyond: Have Gems? We'll Travel..
A couple of weekends ago, August 23, 2008, we hopped in the car and headed out towards Coker Creek, TN. We asked lil' bit (Ashby) what she wanted to do for her birthday, rather than have a big party. As it turns out we mentioned taking her to go gem mining as we had heard about this place from a couple of our HAM (Cathy KI4YPO and Rick N4JTQ) friends. When she heard about gems and mining she was totally game. So off we went to Cokercreek. Cokercreek is about an hour and a half drive from Knoxville, TN past just south of Tellico Plains. 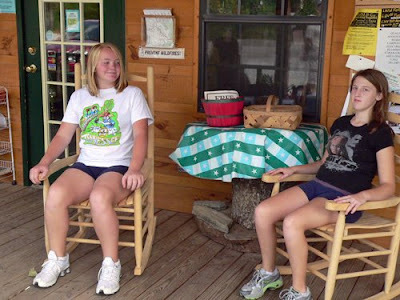 It's a quaint little town filled with artisans and craftsmen, and a natural beauty that is to die for. Upon our arrival in Coker Creek we started looking for the Gem Mining place as the directions were a little confusing at first. We apparently took a wrong turn and drove almost 2 miles in the wrong direction. We finally turned around and stopped in at an art gallery and asked the lady inside where the gem mining place was and she informed us that it was back by the visitor center where we came into town at. So off we went back to the visitor center. We found the Gem Mining place right there about 200 yards away from the visitor center/post office. 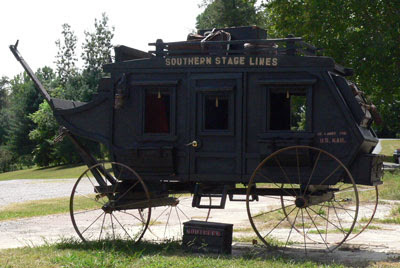 There in front of the visitor center was an old timey stage coach. 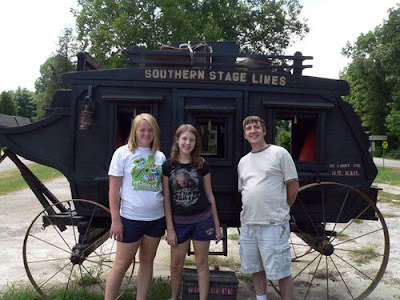 We went into the visitor center before heading over to the gem mining place. There were several items for purchase, so to leave our contribution we let the girls buy one pencil each which had animals on the end. One a deer and the other an owl. After the visitor center we walked down to another craftsman's shop. This was a interesting shop, filled with novel knick knacks, art, and homemade handcrafted jewelry. The proprietor of the shop was an interesting gentlemen who informed us of some of the happenings of the town and a few other merchants. He made mention of the bee keeper on down the road, of which we made note to visit before we left Coker Creek, a visit as you will find out we regretted afterwards. 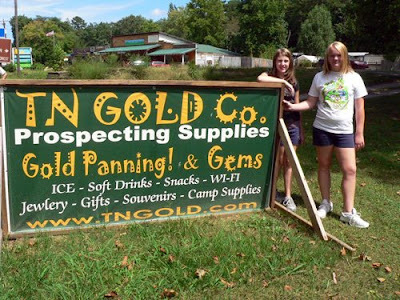 Finally, we headed over to the gem mining place, TN Gold. The proprietor of this place, Tim, I have to say was a very knowledgeable, and nice man. He helped identify most of the gems and stones we found. We purchased 5 bags of gem filled dirt to pan through for $20. Out to the flue we all went with screen boxes and our bags of dirt. We sifted and sifted and sifted until our hearts were content. We found several big gems in our dirt. Large pieces of quartz of different colors, and other various gems. When we were done, we bagged up our loot, and bought another bag of dirt a panning dish, and a little sucker tube. 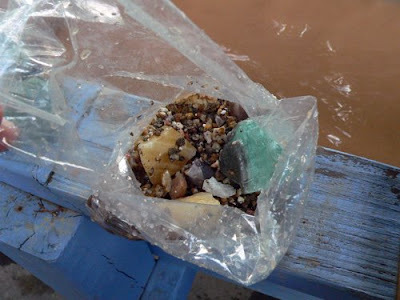 The bag of dirt is supposed to have some gold in it from Cokercreek. As it turns out, you can up the road a little bit from the gem mining place, provided you have your own equipment, and pan for gold in the creek on your own. Upon leaving the gem mining place, we decided we would go and find the falls that the one craftsman had told us about. Well on our way we ran across the bee keepers place and decided to stop in for some honey. All I'm going to say is that after an hour later we finally got out of that place. We left that place knowing more than we cared to know about some psychic nut, I forget the name at the moment, from Virgina Beach, all the town gossip, what all the locals were up to, what type of theft was going on in the area, and a small bottle of blackberry honey. After leaving, should I say running, from the bee keepers place we decided we would leave the Cokercreek area and head back towards the homeplace. It was a fun an interesting trip when all was said and done. 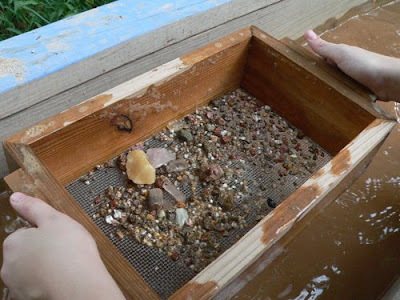 If you ever have a hankerin' for gem mining or gold panning, I suggest a visit to Cokercreek.